yellowpencil: Fiserv content author environment redesign - Open Text Web Solutions Usergroup e.V. Fiserv, Inc. is highly regarded for its financial services technology and innovation, including award-winning solutions for mobile and online banking, payments, risk management, data analytics and core account processing. With over 14,500 clients and 21,000 employees around the globe, they have a substantial amount of varied web content to manage. The Fiserv Digital Marketing team was having great success with their new content management system (CMS), and wanted to expand their team of content authors beyond the dedicated website management team to include people in other roles throughout the company. Giving more people access to the CMS meant they had to be equipped to create, publish, and maintain great web content. 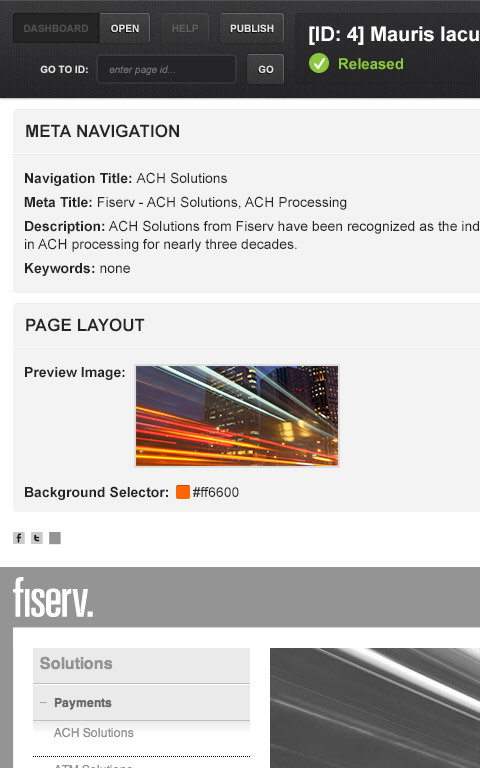 So we set out to help Fiserv improve the usability of their CMS interface. This might not be the most glamorous project – nothing we did even saw the light of day beyond the Fiserv internal team – but it’s critical work for big organizations. Redesigned the content author user interface. We made it clearer and more intuitive, so authors can quickly understand the templates and content elements available to them. Wrote embedded assistance text for content elements. Embedded assistance text helps content authors understand how to use the elements in the CMS. This is a big help for occasional content authors – they often get trained on the CMS, don't use it for a while, and forget what they've learned. They don’t need heavy-duty training documentation, they just need a little nudge to help them remember. Restructured and consolidated content templates and elements. We designed an editing environment that allowed authors to edit their work quickly and easily. This made the CMS even more efficient: content authors don't have to wade through unnecessary elements to find what they need. More structured content makes everything easier to find, store, manage and reuse. Created a tool for code detection. One of the challenges of working in OpenText Web Site Management is keeping code from different environments in sync. We built a tool that automatically detects any differences in template files, so we know exactly where to apply updates from development into production. The SmartEdit project has increased the efficiency of our web content update process exponentially. Our focus on usability paid off, as we were able to empower content authors throughout the company to make their own web updates within established guidelines, and free up our web administrators’ for other tasks.